From over 1000s of feedback, we have chosen a few in order to capture the bulk of emotions and suggestion by our dear customers. Srinivasan R, Chennai (SSCT Program) said..
NALS does a fantastic job of executing their plan. As someone who has been in services delivery for all of my professional career, I’m very impressed with both your planning and the execution to that plan. From the time we landed at your camp in Manali till the departure I was able to observe first hand how your team executed to your original plan. Dinanath is a very solid trek leader and an able project manager. His management of the trek, his team and the customers is very commendable. He deserves credit for a large part of this successful trip. I cannot fault any aspect of the trek or the execution of your plan. Perhaps the only area I thought differently was the final camp and if it could have been at a higher altitude as opposed to where we were in the Beas valley. On reflection it was AMS that hit me around 14000 ft. and while you motivated me to keep going, I was wondering if we had camped maybe at about 12000 ft. or so, I could have acclimatized better. But you are the better judge on this. I look forward to my next trip with NALS, definitely next year. Prabhu, Phd Scholar, Bharathiyar University, Coimbatore said..
We are so happy being with you past 3 days. We don’t like to leave from there. We have entered NALS campus with great expectations and you have filled up all those expectations and you have given great wisdom of life. Already I had different kind of training and camp from different skilled persons. But you are quite different in approaching the trainees. Before attending your training I have ego which you said as MADA. Your speech totally destroyed that. I have transformed. We can’t sit any class as human beings we can have brain attention maximum 20mins. But you have broken the rule. Because everyone had attention in your class more than 2 hours. I hope every teacher should learn this from you. Your way of communication is very much interested I am honestly saying that I have been thinking that English communication always make uncomfortable who belong to Tamil region, but you have given such a wonderful comfort in language also. I didn’t see in my life such a people carrying the trainees as their children’s, but you have been with us 24×7 in this 3 days program. You and your trainers care should be appreciated. Health, status of relationship, do what you love (you love what you do), financial freedom, really very much hold thoughts. Financial planning as well as investment planning has given new thoughts on future saving. Often you have mentioned about your parents and your responsibilities in your family that should make everyone think how should be with family. Finally I like to thank you behalf of our team, your service should be receive every person’s especially who are struggling psychology. Salute your service to the nation…. Now that it has been a week since we returned from India, and all the jetlag has worn off, my sister and myself sat down to contemplate and reflect upon the incredible experience that we underwent in our visit to NALS. During this contemplation, we were able to truly acknowledge the immense help you offered us through the NALS program. By giving us the opportunity to climb, trek, and enjoy the surroundings you gave us a unique exposure to the beauty of Kunur. However, what I personally found more valuable is the advice you gave on multiple topics such as fear, fate and bad habits. Whenever you can, please send me your further Trekking Plans and Programs under NALS Banner, so that I can share with my friends and kindle their interest in adventure. Me and Rupa would like to sincerely thank you for this amazing opportunity to explore such an amazing place, and the invaluable knowledge that you were kind enough to share with.We also greatly enjoyed meeting your family in Coimbatore, where we were able to spend some quality time talking to them. We will most definitely be coming back to NALS as a family, but I intend to go and complete climbing courses that will enable me to be an instructor at your facility. Please extend our gratitude to your trainers who helped us immensely, and we hope to meet you soon. Santhya, Correspondent, Yellow Train School, Coimbatore said.. I am writing to share with you our beautiful experience at the NALS Camp at Manjacombai. Firstly the place was breathtaking. Such a pristine and scenic place with such fresh air that it filled our eyes and lungs. It was special to spend 3 days amidst that lush green, view of the mountains and the occasional gaur that children were excited about and not to forget that kitten that children indulged with all day long - he was even sleeping on the bunker bed with a couple of children. Secondly the food - It was really such tasty food. What touched me was the fact that literally every meal had something we could indulge on like payasam, a special fruit. While the philosophy was about going back to basics great care was taken to give us healthy and tasty food. Now coming to the core of the program. 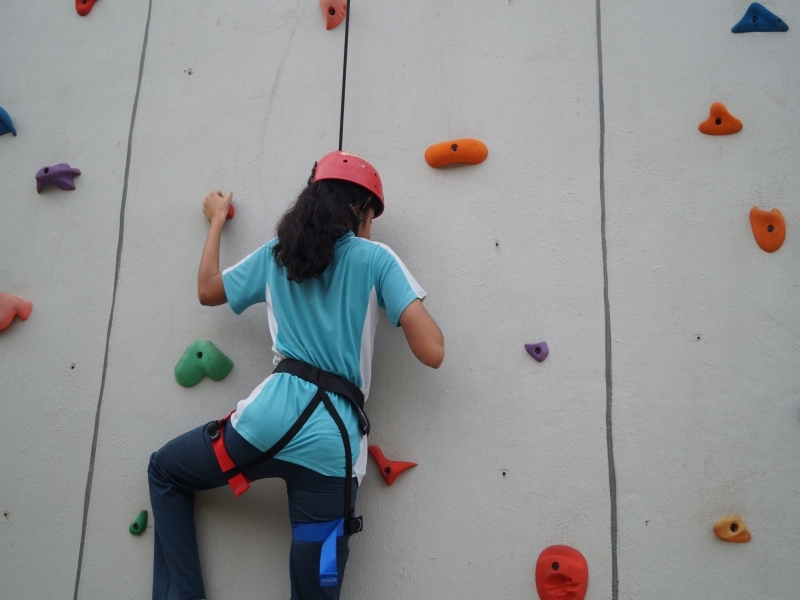 What an exhilarating experience it was - The high rope course, the free fall, the zip line, the Night walk. Children really learnt a great deal. We closed the program with a circle of sharing - what they liked, what was a struggle and what are they thankful for. The amount of gratitude children had for the Nals team is something we have left back in the middle of your hall - when you both visit the camp you can dip into it. Special special thanks to Chandru for his attention to every small detail, checking with us frequently, asking us for feedback and loving the kids in his own firm way. We will be back and I want to thank you on behalf of my whole team. I wish many many more children will make use of this program to build something for themselves and their future. Hariharan V, GM - Operations, Messer Cutting Systems said..
At the outset I would like to thank YOU and your team for the Inspiring session on 9&10 Oct 15.Though I could not make it, I could hear a lot from our team who attended it. All seem to be thrilled and ignited. Surely you made a spark in their mind and body. Everyone was praising your effort and enthusiasm. I really missed it. Once again our heartiest Thanks to you and your team. Vivek Bhide I Managing Director, GVR-India said..
Mr. Seshadri - hats off to you and your team for making our stay a memorable one! We all have been inspired by your thought provoking insights and being able to connect with nature through Night Trek, Morning Walk, High Rope Exercises were excellent. Marilyn Jacob, Cognizant Technology Soultions said..
Our team indeed had a great experience during our visit to NALS Coonoor. The “High rope” activity was the show stealer and it was a transformational experience for each and every one of us as we connected back with nature and went through all the exciting outbound activities. Many thanks to the trainers who kept us thrilled and engaged throughout the day and at the same time ensured our safety. We would also like to thank the entire support staff who took care of our food and other requirements. Overall, it helped us take a nice break from our regular routine to recharge ourselves. Gauthami, Aklavya International School, Puducherry said..
© 2019. NALS - Super Climber. All rights reserved.